EDIT: This post if flawed. There actually is a built in method Installshield’s boot-strapper uses to validate the prerequisite install was successful. In a Basic MSI project: Right click on the prerequisite > edit > Behavior tab. Here there’s a drop down: “If, after installing the prerequisite, the conditions still indicate it is required” > Abort the setup. However, this setting wouldn’t work if for instance you were installing .NET Framework 3.5 SP1 which could fail to install it’s bundled copy of .NET Framework 2.0 SP2. (Of which I’ve had reported). In this case, using the suggestions below to use Launch Conditions that check for 2.0 SP2 would be prudent. We’ve all come to love the ease of adding redistributables to our deployment package through Installshield’s Prerequisite editor. One thing that’s not so great about it though is that there’s no validation performed to ensure the prerequisite was actually installed. Our QA department discovered and edge case relating to a failed prerequisite download and I’m going to share the fix I employed to validate that the prerequisite was really installed. The summary of this post is to point out that prerequisite downloads can fail, but you can validate they were actually installed using MSI Install Conditions. Additionally, silent installs using the msiexec rather than the Installshield’s setup.exe bootstrapper will also not install prerequisites. This is another reason to use MSI Install Conditions. To catch this ‘edge case’, it’s a good idea to also add an install condition (LaunchCondition table) to your msi. In a Basic MSI project you can find these settings under General Information > Install Condition. There’s a few different ways to detect the .NET Framework version, but I’m using the MsiNetAssemblySupport property. 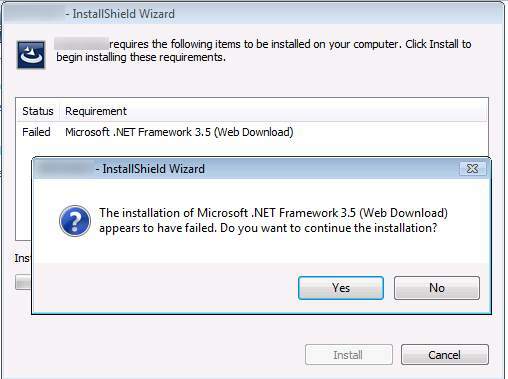 Message: You must install .NET Framework 2.0 Service Pack 1 or higher before installing this product. Only the later will install prerequisites, so it’s up to you to author install conditions to ensure the system does indeed have the perquisite present on the machine.